With an aim to give an opportunity for students to continue their studies through distance learning, the Open School started giving courses for Open regular scheme. The Open School which was setup after the de-linking of the Pre-degree course from the universities proved to be a great success. From 2002 onwards, the department started accepting private registration for higher secondary course. In less span of time, the Kerala State Open School became the hub of a large number of students while motivating them to carry on their education along with their lively hood. As a part of e-governance program, from 2009 onwards open private scheme has been automated while the students can directly apply for the open private scheme online. Through an easy registration by fill-in the SSLC registration number, date of birth and complete details with photo, students can make an effortless entry in the website. An attractive feature of the process is that, the students can opt up to ten choices for the examination centres. This hassle –free online method has helped the students to complete the registration process in less time. As the details are obtained uncomplicatedly, the verification is being done with ease. As various reports including memos for each student with the complete description of the allotted school, course undertaken and other student details with photo are generated by the specially designed system, it enable the applicants to get the data promptly. In the previous year, allotment was given to more than 90,000 students with 80,278 students applying online and other 10,644 students manually. Even though more than 5 lakh candidates have applied for the Plus One admission, the number of seats available is limited to 3.67 lakhs with 3.27 lakhs in Higher Secondary, VHSE 26,000 in VHSE, 9,000 in Polytechnic and 3,000 in ITC. Even though more seats are expected to get allotted more, more than 1 lakh students have to continue their learning procedure with the open school. After the allotment procedure of the Kerala Plus One 2014 reaches the final stage, application would be invited from those students who wish to purse education with the Open School system. 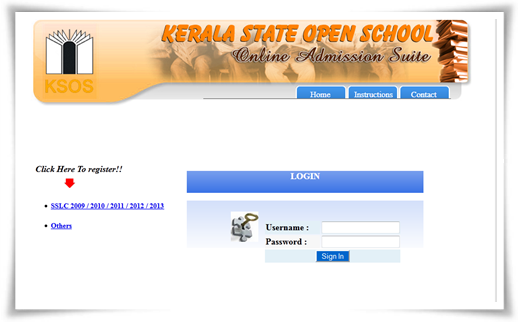 As soon as the education department makes a notification regarding the Kerala State Open School plus one admission for the year 2014 -15, Students who have obtained minimum D+ grade in all subjects in 10th standard or SSLC/equivalent examination and qualified for higher studies can apply for any of the course. The Kerala State Open School Admission is being conducted by SCERT with courses offering in Science, Humanities and Commerce. The application notification will be published in the leading malayalam news dailies and also in the web portal. Students and advised to keep in touch with the newspapers and www.ksosonline.in the official website for more updates.